Woodworking involves many different types of machining ranging from sign making to furniture and cabinet machining. The breadth of our CAM product offerings are well suited to handle the demanding needs of woodworking companies. The woodworking industry encompasses many well known disciplines like cabinetry, carpentry and furniture-making, just to name a few. Prototyping and Tool & Die are also disciplines where woodworking is largely employed. This industry employs mostly 2-½ and 3 Axis toolpaths to cut nested components from sheet stock on 3 Axis CNC Routers. The ability to automatically decompose a cabinet assembly into nested sheets ready for machining is a plus for any CAM software. This industry is a niche field of the architectural building industry and produces both stock and custom millwork components such as stairs, rails, and gilded paneling just to name a few. 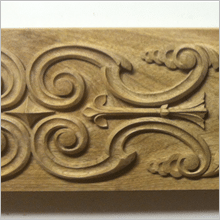 Due to the organic design power of today’s Computer Aided Design tools, millwork components can require the use of 3, 4 and 5 Axis CNC Milling Centers. This industry includes artistic, industrial, and functional design disciplines employed by designers and artisans alike. The form and function, of furniture design components, dictates that they employ primarily 2-1/2, 3 and 4 Axis CNC Milling centers. However, some decorative pieces can employ 5 Axis techniques as well. This industry applies woodworking disciplines to a large degree. Here we include the production of composite form molds, vacuum form molds, and proof-of-concept designs that are largely machined from wood and wood by-products. These designs can also employ 3, 4 and 5 Axis CNC Milling Centers. You may think this industry would mainly include metal cutting. However, prototype and production molds are also machined from wood and wood byproducts as a proof of concept for mold cores and cavities prior to production. It is much easier and less expensive to change a cavity concept in a wood model than it is in an actual steel cavity. See How MecSoft Software Can Help You in Your Business!